Omnicare Are Hosting A Pop-Up Shop This Saturday! Come one, come all! Omnicare are hosting a pop-up shop this Saturday, July 14 from 8am-2pm. 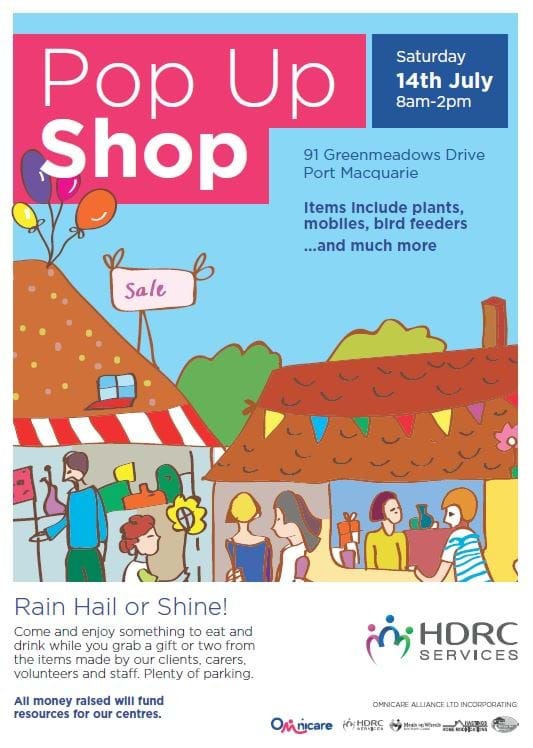 There will be a range of handmade items ready for you to peruse, including bird feeders, bird houses, plant pots, fair houses, kids' blocks, bath salts, Christmas goods, pin cushions, greeting cards, jewellery and more! All items have been made locally by clients, carers, volunteers and staff at Omnicare Alliance day centres at Port Macquarie, Wauchope, Laurieton, Kempsey and South West Rocks. Proceeds will go towards funding resources for the six HDRC centres. Plus, the event will enable you to meet the chooks, rabbits and birds that clients help to look after at the Greenmeadows centre. You won't go hungry, either! There will be homemade goodies, a sausage sizzle and tea & coffee. HDRC (Hastings District Respite Care) runs Montessori-based activities programs for clients living with dementia. Participating in purposeful activities is an important factor in promoting greater independence at home and enjoying an improved quality of life for people in the early stages of the condition.